Computerized sewing machines have come a long way in the last few years. While they used to be confusing to navigate and quick to break, today’s computerized models are fantastic! They’re versatile, convenient, and user-friendly! Of course, there are still quite a few crappy models on the market. For this guide, we’ve weeded those out, and come up with a roundup of all our favorite computerized models available today! In our in-depth reviews, we’ll explain why we think these are better than the competition. We’ll take you through all their key features, and help you figure out which computerized sewing machine is the best choice for you! Brother’s HC1850 is by far our favorite inexpensive computerized machine. It’s not the cheapest on the market, but we think it’s the least you can spend to get a truly great computerized machine. It’s versatile, roomy and reliable. The Brother has a whopping 130 stitches onboard. You also get a complete monogramming font and 8 different one-step buttonhole styles. It also has a very generous work area, plus lots of quilting features for those folks. We think it’s the best computerized models for new sewists, or for more experienced needleworkers who want lots of features without spending a premium. The Brother’s best feature is its versatility. This is a model that really exemplifies the amount of features and conveniences computerized sewing machines offer. It has more stitches onboard than anything in its class: 130 in total. There are ample possibilities for any project, from decorative edgings to workhorse fasteners. That total of 130 isn’t even counting the complete monogramming set onboard the Brother. It has a full alphabet and number set programmed in. The stitches are all displayed in a chart right on the face of the machine. It shows the first 100 stitches on the main two plates. The bottom plate also flips up to display the rest of the options. It’s a really clever use of the space on the machine, and it saves you scrolling through over a hundred stitches in the computer to find the one you want. Most computerized models at this price have a few one-step buttonholes built in. The Brother trounces the competition with 8 unique styles! They all resize automatically to the buttons you’re using. All the options are easy to navigate on the computer. It has simple up and down navigation buttons, which allow you to select your stitches and make adjustments to length and width. the screen is roomy enough to show you everything you’ve selected for each stitch. There’s a speed control slider which limits your top speed with the foot pedal. It can also be used to set a constant sewing speed if you want to use the start/stop button instead of the pedal! Precise speed control is one of the best features on a computerized model! The Brother has an automatic needle-threader for convenience. It’s very easy to master, and it works reliably each time you start sewing. This model has a drop-in, quick-set bobbin. It’s much more convenient than fumbling around with a side-loading compartment like many manual machines have. The Brother’s bobbin compartment is jam-resistant and as reliable as the automatic needle-threader. For winding, there’s an automatic system. You just set up your bobbin and spool, then slide the spool to the right. The machine will do everything else for you! This one has lots of features that lend themselves to quilting! The Brother has a detachable extension table to give you more room for big projects. It also has 14 stitches onboard that are specifically designed for quilting. And you can always drop the feed dog to go free-motion. Quilters will also benefit from the Brother’s adept performance with thick and layered materials. The HC1850 is noticeably better than other affordable computerized models when tackling tough jobs. It’s heavier, which certainly helps. Still, the motor and build quality perform admirably on denim projects and thick layered pieces which stymie other machines in this class. It has a free arm for cylindrical sewing. There’s a bright LED worklamp. It’s extremely user-friendly. A lot of computerized models in this price range have plenty of features but poor user interfaces which make it frustrating to try and use them. The Brother’s manual and instructional videos (on DVD or for free online) are thorough and straightforward. This is an excellent choice for a new needleworker who wants an accessible first sewing machine. It’s also an ideal introduction to computerized sewing machines for experienced folks who haven’t used them before. The Brother is much sturdier than other computerized machines for the same price. While it’s still made mostly from plastic, the parts feel better and last longer than the competition under $200. It’s light. At around 10 pounds, the HC1850 is extremely easy to move around. You could easily bring this one to a sewing class, or between homes. We think the Brother provides a great deal of value for the price. It’s also much more reliable than the cheaper computerized options available. Still, it’s close to $200. While the HC1850 does a lot better than comparable computerized models on thicker materials and layered pieces, it’s not as good as a sturdy $200 manual machine or a more expensive computerized model. More than 3 layers of denim will be a struggle. The monogramming set on the HC1850 is super handy, but it’s limited in comparison to more expensive models. You can’t change the size of the font, and there’s only one font to choose from. Brother make versatile, feature-packed computerized machines for a lower price than many other brands. 90% of the time, they work beautifully. The downside is, of course, the other 10% of units. The company has rather poor quality control, and this model isn’t an exception to that rule. So, make sure you test and inspect yours thoroughly before you return window closes! The HC1850 also has poorer reliability than our more expensive picks. It’s much more reliable than other computerized sewing machines in its price class, but it has mostly plastic parts which are a bit delicate. The automatic needle-threader is one feature you’ll want to be particularly careful with. The Janome DC5100 is our favorite midrange pick in the computerized category. It’s loaded with automatic features and conveniences. Plus, it has even more onboard stitches than the Brother! This is a more advanced and intuitive computer workstation than the Brother. The DC5100 has a smarter computer system which allows you to create your own patterns, set your own preferences, and get to your stitches more quickly. It’s a machine that really suits intermediate and advanced home crafters, as well as ambitious beginners who are in it for the long haul! It’s got even more stitches built in than the Brother! There are 167 in all on the DC5100. That total spans a full range of decorative and utility stitches, as well as specific choices for quilting and other common projects. We think this one has more options than most home users will ever use. It has a full alphabet and number set, along with some common symbols. Unlike the Brother, the Janome’s monogramming font is adjustable! There are three different sizes to choose from. At the largest size, the font is about 1/4” in height. There are also 5 different one-step buttonholes to choose from. That’s fewer than the Brother, but probably still more than most people will ever use in practice. You can set memorized positions for the needle up/down movement. That’s handy if you commonly work with thicker materials, or if you simply have a strong preference for where things line up as you work. You can also add up to 50 of your own custom patterns to the computer! There are memory banks built in, and you can replace your saved patterns as many times as you want. As you can see, the DC5100 is much easier to customize than the Brother. So, it suits someone who knows what they’re doing and what they want from their workstation! Navigating all the built-in features is much easier than with the Brother, thanks to the Janome’s full keypad and larger screen. You can dial in the stitch you want much faster with the number keys than on the Brother’s up/down arrows. The Janome also has dedicated buttons for length and width adjustments. Overall, it helps you get to what you want more quickly. This one’s so versatile that it gives nearly anybody room to grow. Beginners and intermediate needleworkers won’t be outgrowing the Janome in a hurry. It’s also a good, reasonably-priced option for advanced home sewists who can’t afford or justify the price tag on the Juki below. It has automatic tension control which works more reliably than the Brother’s. It’s really quite impressive, given that sew few automatic tension machines work smoothly all the time. The DC5100 adjusts itself to different thicknesses and materials effortlessly 99% of the time. There’s also a backup knob if the machine doesn’t quite get it right once in awhile. We don’t think you’ll need to use it, though. Like the Brother, the DC5100 has auto-declutch bobbin winding. There’s an automatic needle-threader, too. It’s as easy to use as the one on the Brother. More importantly, it’s built sturdily. The Brother’s threader is plastic, and a weak point of the design. The Janome’s is made of metal and designed to last. There’s a drop-feed function and free arm, just like the Brother. It comes with a locking stitch button! We absolutely love these, and they’re one of the best things to come out of computerization. You can tie off your stitches without having to reverse and make a mess of your piece. There’s a sliding speed control, plus a start/stop button for sewing without the pedal. As with the Brother’s speed slider, you can use the Janome’s to limit the top speed on the pedal, or to set a constant speed for push-button stitching. The flip-up stitch chart built into the Janome’s hood is more unobtrusive than the one on the Brother, without sacrificing convenience or legibility. It flips up to show all the stitches, and then closes to leave a clean, uncluttered casing look. The DC5100’s biggest advantage over the Brother isn’t any one of its features, though. It’s this machine’s impressive reliability record. It might cost you three times as much to buy, but the DC5100 will likely last you several times as long as a Brother. It has a metal frame, to start. It’s heavier overall, and has far more metal components than the Brother. Little touches like the automatic needle-threader are much better made, and will perform better over years of use. The motor also packs more of a punch under the hood. Where the Brother is loud and a bit rattly, the Janome is quiet and smooth. It does much better with thick materials and layers. Thanks to the motor and the excellent auto-tensioning, it’s more consistent and reliable than the Brother, by a big factor. It has a very helpful, thorough instruction manual. The DC5100 comes with a hard case right out of the box. It also has a better track record since it’s been on the market. In fact, we haven’t heard of any reliability issues with this model at all! Janome’s are generally very impressive in the quality department, but the DC5100 is a real gem. It’s expensive. You probably won’t find this for less than $600. That’s a lot for a newcomer to spend, which is why we mainly recommend this to intermediate and advanced needleworkers. It’s certainly an accessible enough machine for a new sewist, but you want to be sure you’ll get your money’s worth out of it before making such a big investment. You’re paying mainly for better build quality, as opposed to paying for more features. The DC5100 does have a few extra stitches and the memory bank feature over the Brother. However, the big difference is primarily in durability and reliability. This is much more of a workhouse unit than the Brother, even if it’s not wildly more versatile. Even though it’s substantially better than anything else we’ve seen in the <$1000 computerized category, it isn’t quite as rugged as the $1000+ options. You’ll also see a big increase in versatility once you consider a machine over $1000. It’s a bit large and weighty to take to a sewing class or quilting group. You’ll also have less room for quilting on the Janome, since it doesn’t come with an extension table. You can always add one later, but you’ll have to pay extra. The Juki HZL-F600 is an absolutely spectacular sewing machine. We think it’s an exemplary model that demonstrates the best of what computerized sewing machines have to offer. It’s a worthy choice for professionals and the most passionate home crafters. The Juki has a staggering amount of onboard stitches, plus a range of automatic features and conveniences that puts other machines in its price bracket to shame. 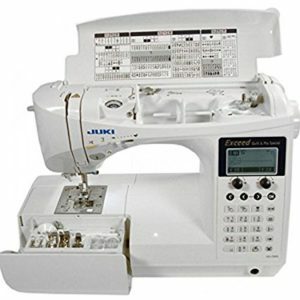 It also boasts build quality and reliability that rival anything Janome makes in this price bracket. We think it’s the perfect machine for most demanding users. It has by far the most onboard stitches of the bunch! The Juki packs an incredible 625 onboard–as many as the most demanding professional could want. That includes 4 entire lettering fonts, 16 different buttonhole styles, and dozens of utility and decorative stitch options. The Juki has a keypad to dial in stitches like the Janome. It’s even better, though! This keypad is also lettered, like you’d see on a feature cell phone. So, you can use the numbered keys to choose letters, instead of having to scroll through the entire alphabet! The keys each have a go-to stitch marked, as well. That allows you to quickly start one of 10 common patterns, like appliqué and blanket stitches. You can preset your own patterns and customized stitches, much like you can on the DC5100. The Juki’s memory system has room for 70 patterns, and it also allows you to sort your saved patterns into folders. As with the Janome, the Juki’s screen is large enough to easily display the stitch selection, dimensions, and patterns. It’ll tell you which foot to use, as well! The Juki’s screen can show you onboard guides, troubleshooting diagrams, and more. You can also adjust nearly every aspect of the Juki’s computer. That gives you even more room to customize than the Janome! You can program your favorite needle up/down positions, and set your preferred volume for the machine’s alerts. Where it gets spectacularly good is in the programming features. You can program the machine to trim threads automatically at the end of a set length, so you don’t even have to stop or trim manually! You can also program a set pattern or a sequence of patterns to stitch as many times as you want. You can even program the machine to cut and tie off your stitch at a predetermined length! One of the best parts of the programming setup is what you can do to adjust needle and stitch placement. You can move through variable needle positions, just like on the Janome. The Juki’s extra trick is that it lets you move the positions of a whole pattern, without making any changes to the width. That makes it easy to taper zigzags to one side, or to the center, for example. In short, it makes for fantastic decorative stitching. It should be pretty obvious by now that the Juki is a real sewist’s sewing machine. It offers almost infinite room for customization, so you can make it perfectly suited to the way you like to work. It’s ideal for expert home crafters and working professionals. Size and width get their own adjustment dials. They’re far easier to use than up and down arrows, especially if you want to make a drastic change. There are also a range of other buttons, which allow you to make selections, scroll through menus, troubleshoot and more. While having more buttons can make for a complicated layout, the Juki’s is clean and easy to navigate. Since each button does fewer things, all the menus are quicker to navigate, and much harder to get lost in. The buttonhole feature is a real standout on the Juki. In addition to the 16 different styles, you can also adjust the cutting width on the buttonhole, without actually affecting the stitching either side. So, you can easily make holes for buttons of all sizes and thicknesses, as well as thin and thick fabrics alike. The results are really remarkable. While many home users might think so much sophistication in a buttonhole feature is unnecessary, it makes a world of difference in the practicality of garments and other projects you make with buttons. The Juki allows for a degree of professionalism that’s simply not possible on our other recommendations. As with our other picks, it’s got an easy, drop-in bobbin compartment and an automatic needle-threader. This one has the added feature of a second bobbin spindle. So, you can wind one while you sew with another. It’s as easy to use as the automatic winder features on our other picks. Just like the Janome, the Juki has a mix of automatic and manual tensioning. It will set the tension and adjust all by itself. Or, you can use the simple tension dial to make tweaks if the machine isn’t getting things quite right. As with our other picks, you can adjust the speed manually with a slider, or use the foot pedal. The slider will limit the pedal’s top speed, or set a constant speed for push-button sewing. The Juki also has the added luxury of being able to adjust the resistance on the foot pedal. You can choose how responsive you want it to be! The Juki’s feed dog system is a treat to use. It’s a 7-point design, like the Janome. The Juki’s is made from surgical steel, and it also has a box-feed style design. Instead of using an ovular motion, it works on straight lines to prevent shrinks and shifts. We’ve yet to find a material that it won’t handle smoothly. There are lots of ways to cut thread on this one. You can use a manual push-button, program the machine before you start stitching, or rock back on the foot pedal. If you don’t like the pedal cutter, you can just switch it off. The Juki has an exclusive set of what the company calls “crazy” quilt stitches. They leave shapes along the path of the thread, with variable sizes. For instance, there are hearts which go from big to small and then continue alternating as you sew. There’s also a wheat-like pattern of V-strokes with alternating lengths. It’s a great assortment for making decorative, signature pieces. There are also hand-look quilt stitches onboard! That’s a key feature that the Janome doesn’t have. The Juki’s tensioning system does a great job with your invisible threads, so leaving hand-look stitches is a cinch. As you’d expect, you can drop the feed dogs to go free-motion. Best of all, it comes with an extension table to give you lots of space to spread out quilts (or other large projects)! The Juki has a 21 3/4”width to work with when it’s combined with the table. It has the best work lights of the bunch. The Juki has dual LED bulbs in the throat to give you bright coverage for even large projects. It has both a free arm and a knee lift built in. It’s by far the priciest of our three picks. The Juki will cost you more than $1000. We don’t recommend this to anyone who isn’t a passionate, dedicated sewist for life! We don’t think any newcomer would (or should) spend this much money for a sewing machine. With that said, even if you’re able to afford it, this is probably too complicated a machine to be your first workstation. It simply has so many features and controls to learn that the average newcomer will be overwhelmed. Plus, it’s overkill for anyone who doesn’t use their sewing machine every day. We think this is the best computerized sewing machine on the market for the vast majority of advanced and pro sewists. There are certainly better models out there, but they’re priced so exorbitantly that we don’t think they’re practical purchases for even the majority of professionals. However, if you do want the absolute best of the best, and have an ample budget, have a look at our “ultimate” pick below! The Brother HC1850 is the obvious choice for anyone on a budget. It costs a fraction of the prices you’d pay for our other picks. The Brother offers a great range of features and build quality that far surpasses any computerized models in its price class. On the downside, it doesn’t look so good when you compare it to something more expensive. The Brother definitely won’t last you as long as the Janome or the Juki, especially if you use it every day. 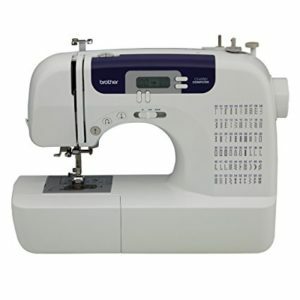 However, it gives you a great taste of the convenience and versatility of computerized sewing machines for a low price. We recommend the Brother to new needleworkers, and to more casual experienced users who don’t want to spend very much on their sewing machine. The Janome DC5100 is the better choice for anyone who’s an intermediate or advanced sewist. It does a better job on heavier materials, and has even more features onboard. The big advantage the Janome has over the Brother is build quality. It will last much longer and perform far more smoothly than the Brother. This is a workhorse machine, and as much as most home users need. It’s not nearly as versatile as the Juki, though. The Juki blows the Janome out of the water where features and conveniences are concerned. The Janome also has a more limited computer system that’s not as easy to navigate as the Juki. We think that professionals and the most ardent home users may want to spend a bit more for the Juki. The Juki HZL-F600 is our favorite computerized sewing machine on the market right now, with one caveat. It’s the fastest of the bunch, and the most durable to boot. It’s easier to navigate than the Janome, which makes some serious workflow improvements for those who do needlework professionally. The best aspect of the Juki is its customizability. You can adjust and tweak every single aspect of the machine to suit your particular preferences and the requirements of the job at hand. It’s overkill for anyone who doesn’t use their machine for a few hours a week, but it’s something dedicated craftspeople will truly enjoy using. It’ll last for years, too! Here’s the caveat: there are better computerized sewing machines out there, but we really don’t think you need them. Sure, you’ll get even more stitches and a snazzier computer system for another grand or more, but so few of us can afford that price tag that we wanted to stick with something realistic. The Juki is as good as anything we’ve tried for twice the price, and only starts to look outclassed by exorbitant model at several grand apiece. So, trust us: this is as much as most people need to spend. It’s good enough for professionals, and more than any home user could ever need. Our top pick above, the Juki, is a fantastic sewing machine. We think it’s more than enough machine for the majority of users. It’s professional-grade, and reasonably priced for what you get. 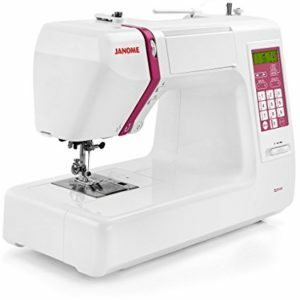 If you’ve got plenty of money to spend on a computerized sewing machine and want the absolute best of the best, though, you ought to have a look at this Janome. It’s simply spectacular. While the Memory Craft 8200 QCP’s price tag makes it an improbable purchase for even most pros, we think it’s the best sewing machine on the market right now. Period. It can quilt even better than the Juki, it has infinite stitching possibilities, and can even do embroidery. With a massive touchscreen onboard, it’s the most intuitive computerized system we’ve seen recently. It feels totally up to date. You still get all the key buttons, too, so you don’t have to do everything on a touch panel. There are too many great features on the Memory Craft to mention here, but suffice it to say that the term “dream machine” totally applies here. Again, it’s far too expensive to recommend to most people. But if you’ve got a few grand lying around and can justify the cost, we don’t think you can do any better. 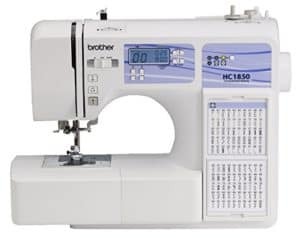 We think that the Brother HC1850 is a very affordable computerized sewing machine. It’s less than $200, and it has much better reliability and build quality than anything cheaper. With that said, we know it may be more than some people can afford. So, if you’re after a computerized sewing machine on a shoestring budget, you should check out Brother’s cs6000i! It’s actually the best-selling sewing machine on the market these days. We haven’t included it in our picks because it has a mixed track record and far fewer features than the HC1850. Overall, we think it’s more than worth it to spend the extra $50 for a longer-lasting and more versatile machine. If the HC1850 is out of your ballpark, though, this is a respectable entry-level choice. The cs6000i has 60 built-in stitches, and many of the HC1850’s key features onboard. It threads automatically, and has a quick-set bobbin system. You can sew with the pedal or a button, and you can adjust the speed via a slider. The cs6000i suffers from the same main flaw as the HC1850, though. It has a spotty track record and extremely light build quality. One of these definitely won’t last forever. However, it can give you a solid computerized sewing experience while you save up for something better! As you’ve seen from our reviews, there’s a massive range of computerized sewing machines out there. So, how do you narrow down which one is the best for you? Here are some key areas to focus your attention as you shop! Before you even start to consider specific machines, you should figure out how much you want to spend for your new computerized sewing machine. Technically, computerized models don’t cost much more than manual models. However, to get a decent one, especially with a good reliability record, means spending more than you would for a manual model. For instance, you can get a very good manual sewing machine with basic features for $100-$150. But you won’t get a decent computerized sewing machine for those prices. Plan to spend 50-100% more than you would for a manual machine on a good computerized sewing machine. Beginners and those on a tighter budget can do quite well for ~$200. You’ll get a lot of the essential features we look for on computerized models, like speed control, automatic needle positions, and so forth. You won’t get amazing build quality at such a low price, though. These models are very lightly-built and have mostly plastic parts. Intermediate and advanced sewists who will be using their workstations on a regular basis should plan to spend around $500. That’s where you start to see machines with far more metal parts and more convenience features. If you sew regularly, you should invest in a real workhorse that can give you years of service. They start in this price range. While these machines have lots of features, though, they don’t compare to the sort of versatility and customizability you’ll see over $1000. If you sew daily, and are passionate about it as a professional or home craftsperson, you might consider spending $1000-$1500 for a professional-grade, full-featured machine. Computerized models in this price class have hundreds of stitches onboard. They also offer much more room for customization than cheaper models under $1000. They’re definitely overkill for anyone who doesn’t do a great deal of sewing, though. As with any manual sewing machine, you ought to devote some time to thinking about which features are most important to you. Most important is figuring out which tasks you want to tackle on your machine. Do you need room for quilting? Specific stitches for a certain type of sewing you do? Rugged build quality for leather or outdoor fabrics? Answering all these questions for yourself up front is the best way to get a sewing machine that you find useful and satisfying. You should also think about which specific computerized features you’re most attracted to. Do you want to be able to make custom stitch patterns? How about things like memory banks or stitch recall? Brainstorm before you start shopping! The biggest difference between great computerized sewing machines and duds isn’t the amount of stitches onboard, or the amount of features. It’s build quality. Without solid build quality, all those flashy features won’t matter, because your machine will break quickly. That’s why we recommend spending more in each price class than we would on a manual sewing machine. You’ll get more metal parts, and more reliable machines overall. A metal frame is the most important thing to look for. Cast iron frames are excellent but increasingly rare. These days, you should look for something with a solid aluminum frame if you can afford one. If one of the computerized sewing machines featured here strikes your fancy, click on the links in its review! You can see all the specs and details, as well as current prices. If you’re having second thoughts about whether you want a computerized sewing machine, head to our home page! We have plenty of good old-fashioned manual models to show you as well. Or, if you’re looking for a computerized model with more specific features, you might have a look at one of our niche guides, like quilting and embroidery machines! You’ll find computerized models in each category.